Cumberland Town Hall is located at 45 Broad Street, Cumberland, RI 02864; phone: 401-728-2400. Photo: Luke Jillson House, ca. 1752, 2510 Mendon Road, Cumberland, RI. Listed on the National Register of Historic Places in 1982. Photographed by User:Magicpiano (own work), 2013, [cc-by-3.0 (creativecommons.org/licenses/by/3.0)], via Wikimedia Commons, accessed June, 2014. Cumberland occupies the extreme northeastern corner of Rhode Island. The landscape alternates between rocky hills and fertile valleys along the river and streams. The Blackstone River, which forms the western town boundary, is a major topographical feature and one that guided much of the town's development. The primary transportation routes run north-south paralleling the river. Other important natural advantages of the town include a variety of underlying mineral deposits and extensive forests. 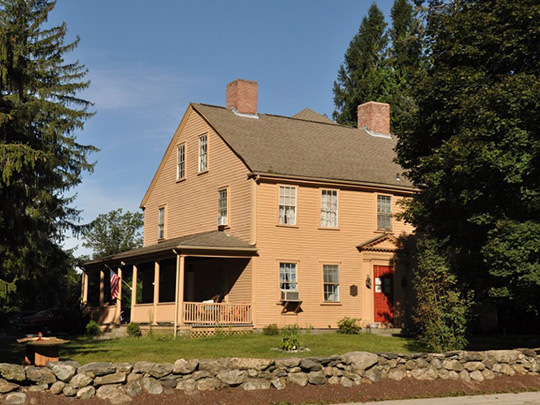 A variety of historic man-made resources, including an assortment of single family houses, help document the ways in which Cumberland residents have used and enhanced the town's topographical features and natural resources over time. Cumberland's remoteness at the edge of Plymouth Colony drew its first settler, William Blackstone, about 1635. Blackstone was an Anglican clergyman and scholar for whom the Blackstone River is named. Settlement began to take form in the eighteenth century, when houses were built and land was cleared for farms in the gentle river valleys and uplands. Agriculture continued as a mainstay of the town's economy through the nineteenth century. It shaped much of the early cultural landscape as well as providing the basis for some of Cumberland's finest rural houses. Cumberland also developed a strong woodworking tradition in small boat construction and house building during the eighteenth and nineteenth centuries. Industries like grist mills and saw mills, mining, iron extraction and processing, were followed in the first decades of the nineteenth century by the introduction of textile manufacturing. The textile industry deeply influenced the course of the town's history, particularly those sections developed with standard-design, company-built workers' housing by the Providence investment firm of Brown and Ives along the Blackstone River at Ashton (1867), Berkeley (1872), and Lonsdale (1860 and 1886). Cumberland Hill and Valley Falls villages also were associated with textile production, but contained a wider range of house forms. Arnold Mills supported several different industries over time and developed as a cluster of handsome houses. Diamond Hill grew up as a loose group of houses linked to the local granite quarrying industry. The Blackstone Canal, in operation from 1828-1848, and the Providence & Worcester Railroad, opened in 1847, followed the river valley corridor and greatly improved transportation linkages to the north and south. In 1868, the heavily industrialized village at the northwest corner of Cumberland split off as Woonsocket. Valley Falls then became the new political center, reaffirmed with construction of a new town hall in 1894. In the early twentieth century, widespread automobile use influenced the pace and impact of growth. Some sections of Cumberland were identified for summer home construction, and while most new houses were small cottages, a few large houses were built as the center of country estates. Later in the century, suburban plat development occurred as Cumberland became a popular location for new homes. Nevertheless, much of the historic housing stock remains intact and well-preserved. Virginia H. Adams, Consultant, The Public Archaeology Laboratory, Inc., Single-family Houses in Rhode Island, 1636-present, nomination document, 1995, multiple property submission, National Park Service, National Register of Historic Places, Washington, D.C.